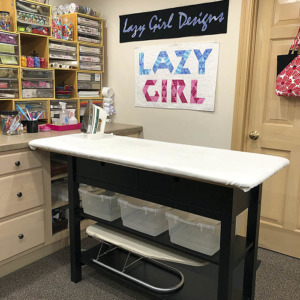 Lazies, Want to stand out at your next stitchy event? 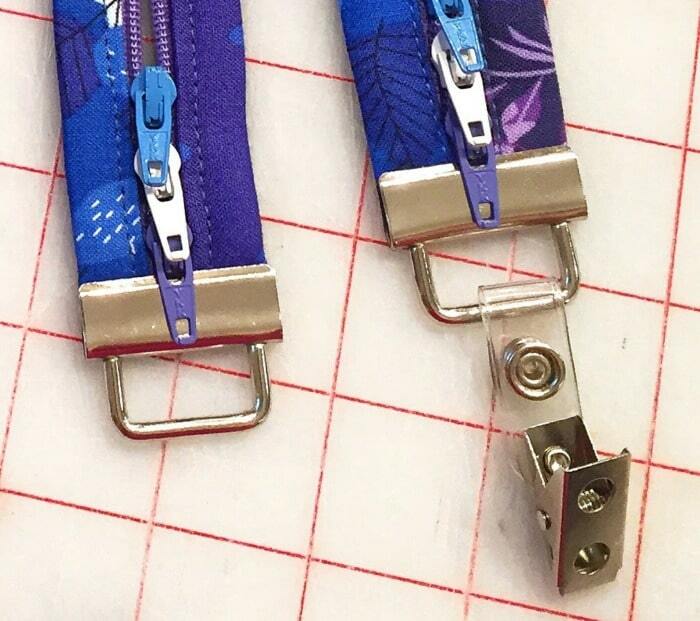 Use my simple trick below to convert a standard zipper to lengthen our new Fobio design for a beautiful badge lanyard. 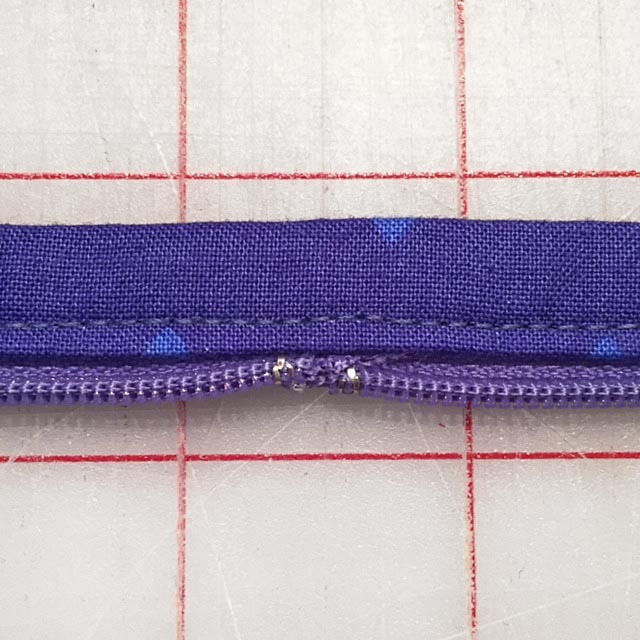 The size of Fobio is limited by the length of zipper when using my One-Zip technique. I’ll show you how to use a 22″ zip to make a longer Fobio. When we launched Fobio a few months ago, peeps immediately started talking about making long Fobios (makes me think ‘Longfellow’) to use as badge holders. I thought the same thing. 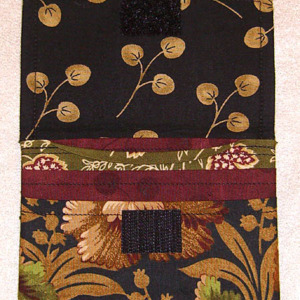 I lengthened Fobio to wear around my neck as a badge lanyard at Quilt Market in October for the release of Fobio, Sweetpea Pods and Becca Bags. (See the long zips I special ordered on Instagram here.) I made a few (dozens!) for business associates and friends to wear at the show. They were a huge hit – there might have been some fighting over who gets what! 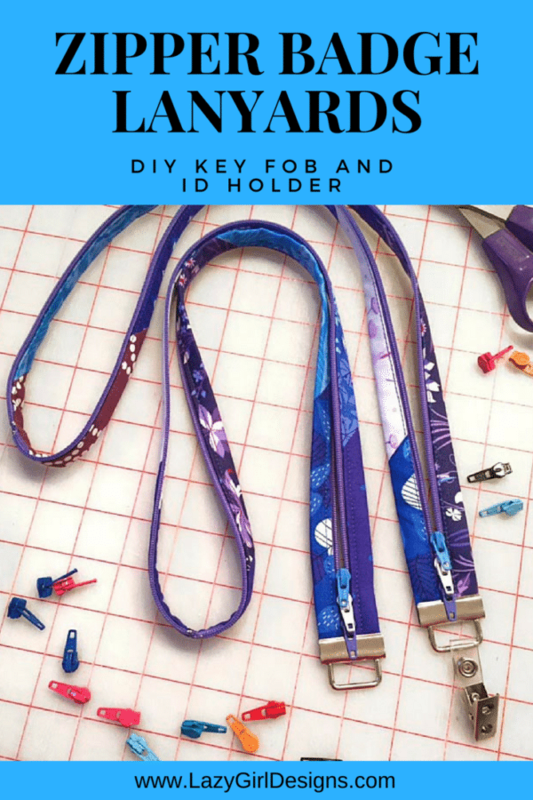 Here’s how you can make your Fobio into a longer lanyard. 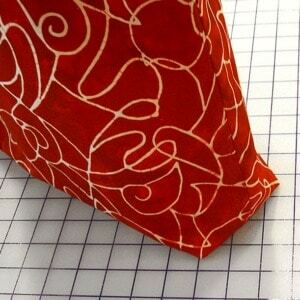 Cut and prepare your fabric as per the Fobio pattern LGD137, but longer. A good length is 36-44″ depending on your height and where you’d like your lanyard to end. I like to showcase a few fabrics, so I cut short strips (6-10″) and pieced them together. You can also use a strip cut from selvage to selvage, approximately 42-44″. Test fit the strip to determine a good length for you. Remember, key fob hardware and a badge will be added to the end, so plan accordingly. 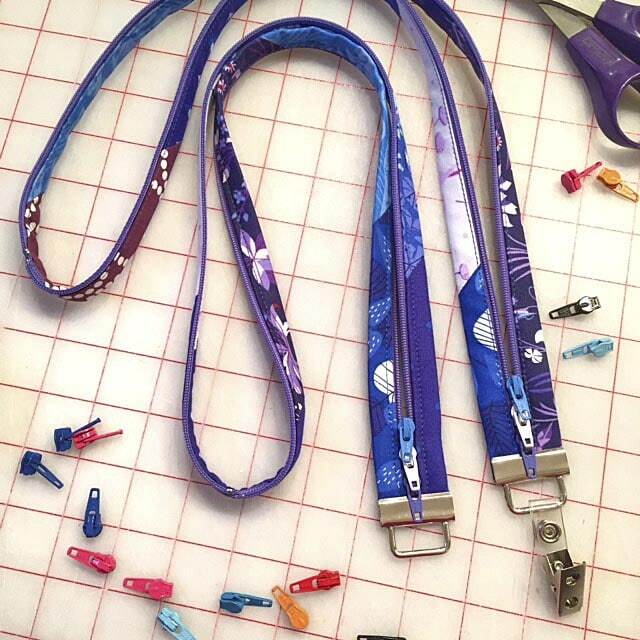 If you already have a lanyard that works well, use that to determine the right length. Here are my Fobio lanyards mid-progress. I prep a few at a time and keep them nice and tidy using Clover Jumbo Wonder Clips – perfect! Then it’s time to audition zippers! 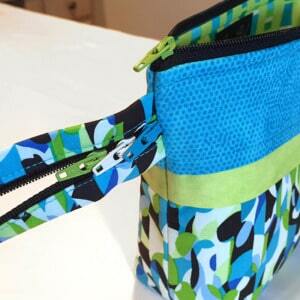 These are 22″ zips from Atkinson Designs. Zippers are a design opportunity. Choose the zip color to support like a background fabric, accent/highlight the fabric, or to anchor and ground a color scheme. 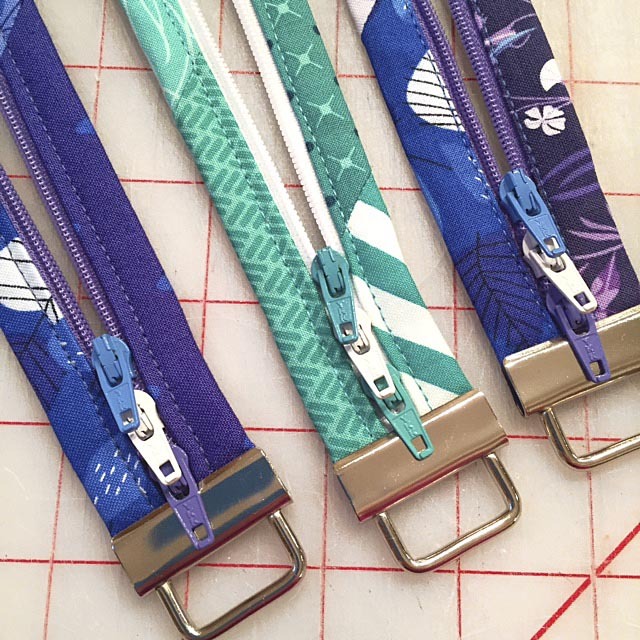 Use my simple trick to make 22″ zips work for these lanyards and this Fobio design – woohoo! 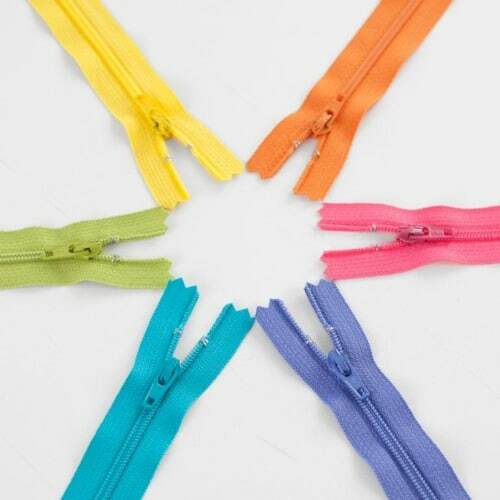 Long zippers do exist, and you can buy yardage of zipper teeth (without the zip pulls), often called ‘chain’. 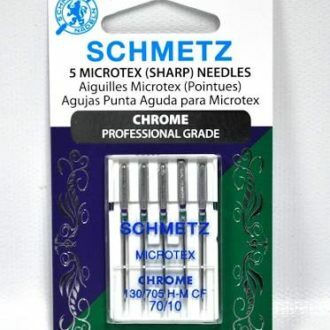 I picked up some black chain from www.ZipperStop.com – sweet score for me! I also picked up 80″ zips from Wawak, available in five colors (cut in half for 40″ lengths). When sewn into the fabric, the top knots are barely noticeable and will rest at the back of your neck. 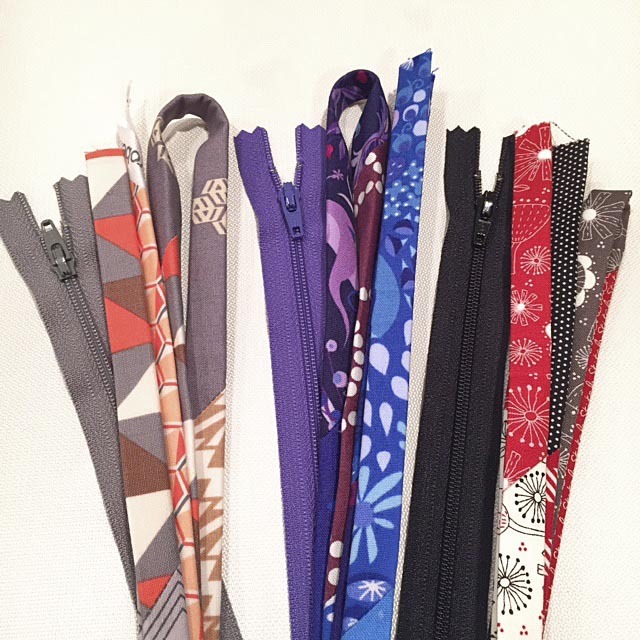 I use Atkinson Designs YKK brand zips and they are comfy – I do not notice the knots when wearing the lanyard. If the top knots on the zip are rough to the touch before construction, they’ll probably be rough against your neck. Test by running the knot between your fingers before beginning. 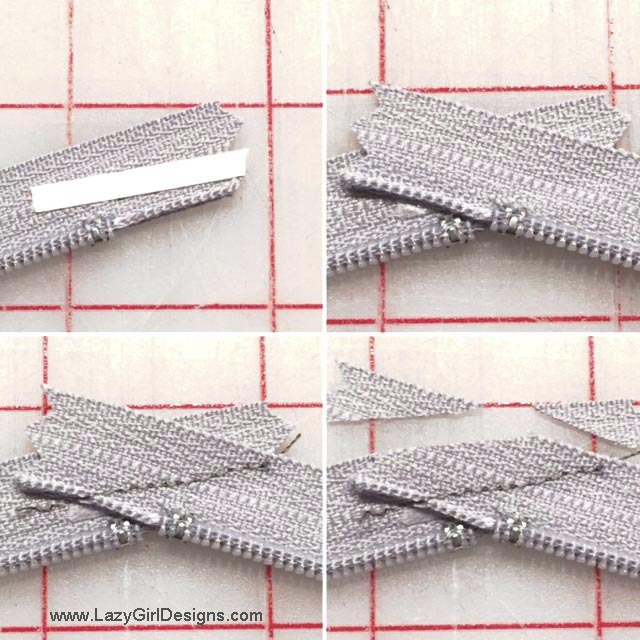 Remember to jazz things up with a few zipper pulls by following the direction in the Fobio pattern. 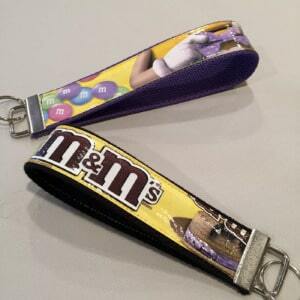 Finish by adding the Lazy Girl key fob hardware. 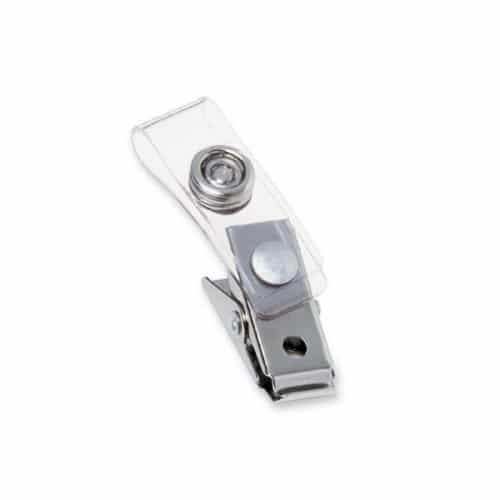 Lazy Girl offers extra Key Fob Hardware in a Refill pack (4 sets LGD711) and Party Pack (25 sets LGD712). Don’t forget our Key Fob Pliers, too (LGD713). Use zips/pulls by YKK brand, size #3 for best results, and they all work for my three One-Zip patterns. You can clip your badge directly onto the key fob hardware, or I picked up a package of these dandy badge clips. Snap the plastic strip around the key fob hardware, then clip to your badge. 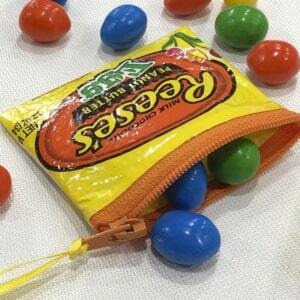 NOTE – zips and pulls must be by the same manufacturer to work together as I’ve shown here. All of the zips shown in this post are manufactured by YKK, regardless of where I bought them. Remember the Fobio includes this info in the Important Zipper Notes on the Fobio pattern. Grab the Fobio pattern in our pattern store here. Grab the key fob hardware here. Grab zippers and pulls here. 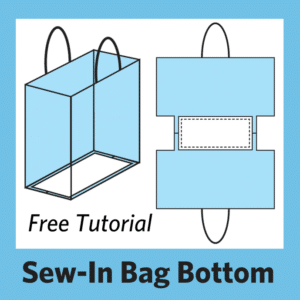 Local quilt shops are stocking all of the patterns, zips, pulls, and hardware in store or online. 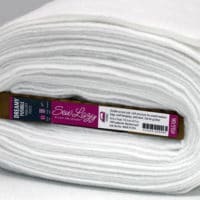 Ask your favorite quilty shop. So grab your Fobio pattern, a few zips, extra pulls, hardware and attitude – and try your hand at a lanyard or two. 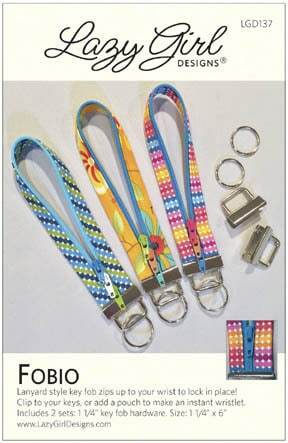 Fobio badge lanyards are perfect gifts for your stitchy friends, great for guild meetings/events, perfect for shop owners/staff – you’ll need one for every outfit! Share this post on Pinterest by pinning the image below. Lazies, what do you think? Where will you wear your Fobio badge lanyard? Post a comment, I’d love to hear from you! I can’t wait for the next quilt show to be stylin’ in my Fobio lanyard! Thanks so much! 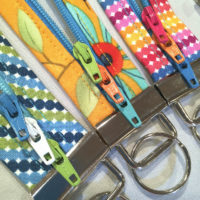 I can’t wait for the next quilt show so I can be stylin’ in my Fobio lanyard! Or prehaps remake my name badge for guild meetings! 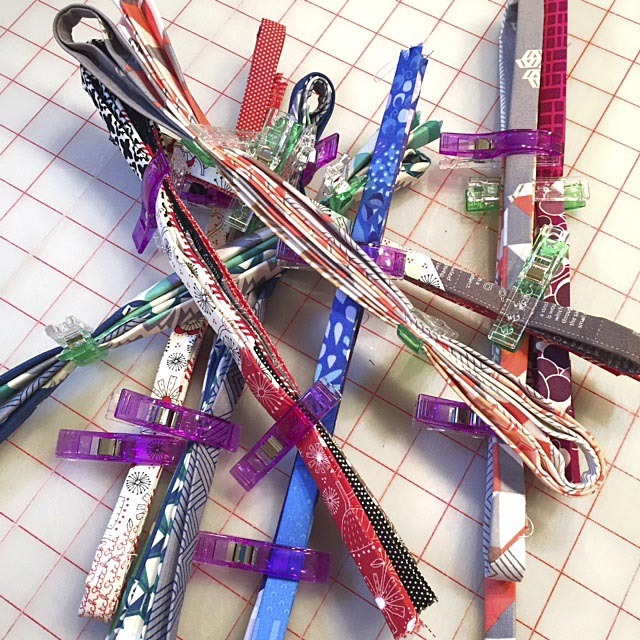 I do remember seeing these on the gals in the booth at Houston Quilt Market – so glad to know how to convert my Fobio pattern to multiple good uses! Thanks for the tutorial and a great pattern!